Description: This animal may reach 15mm in length. There are curved, posteriorly-directed processes at the base of each rhinophore and on either side of the branchial plume. The oral tentacles are long and there is a pair of recurved propodial tentacles. The body is white. The lamellate rhinophores and all the processes are yellow grading into orange at the tips. The gills are similar in colour and there is a small patch of orange pigment at the tip of the tail. Ecology: Feeds on ectoprocts (Kamptozoa) which grow over sponges and other sessile invertbrates. Distribution: First recorded in Britain from the Manacles, Cornwall in 2007. A second record from Skomer Island, Pembrokeshire in 2009. Further distribution from Galicia, Atlantic coast of Spain and Portugal. Similar Species: Easily confused with Ancula gibbosa. 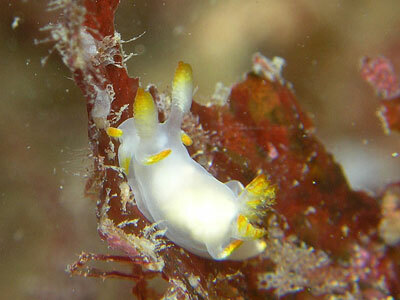 There are several other species with similar coloration including Polycera quadrilineata, Polycera faeroensis and Trapania maculata. No pigment on the body. Recurved yellow, orange-tipped processes at the base of the rhinophores and alongside the gills. Yellow grading into orange pigment on gills and rhinophores. Picton, B.E. & Morrow, C.C. (2016). Trapania tartanella (Ihering, 1886). [In] Encyclopedia of Marine Life of Britain and Ireland.